As part of our content modules you can make changes to your content and re-run our crawler on demand to suit your own workflow needs. Review your external and internal links to help select your page focus priorities. 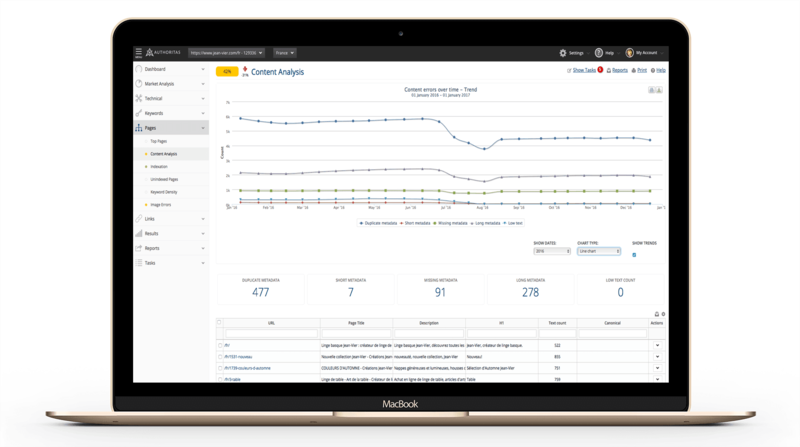 The Authoritas platform helps you automate your team tasks and collaborate with your SEO team to ensure that you don’t miss out on any content optimization opportunities. Once you’re done, refresh your site auditing, page speed and crawling jobs for immediate re-evaluation. Use our Internal/External page link analysis to help prioritize your areas of focus and resolve critical issues. You shouldn’t be guessing which of your pages require your attention first. You don’t want to be manually carrying out all of your SEO tasks. That’s something that you might have been doing 5 to 10 years ago, but things have moved on! We can help SEO professionals get back their time, so that they focus on business-changing activities rather than the manual collation and generation of data and reports. Once you define what needs to be done, the Authoritas platform makes it easy for for you to set tasks for your team and to manage the completion of that work. Create manual tasks on the fly and collaborate with your team on key issues to ensure that nothing gets forgotten about. Something else that we offer is a real-time analysis on the impact of your page changes. As soon as you’re done with the on-page changes that you’re making , refresh your site auditing, page speed and crawling jobs and you’ll be able to see straight away whether the work that you’ve completed has resolved your issues as intended.